Deskbound CIA analyst Susan Cooper (McCarthy) is about to become the world’s newest — and unlikeliest — secret weapon. When her partner (Law) falls off the grid and another top agent (Statham) is compromised, Susan volunteers to go deep undercover and bring down a deadly arms dealer. Loaded with wise-cracking action and adventure, SPY is a mission impossible to resist! I am a HUGE fan of Melissa McCarthy. I have been ever since she played Sookie in Gilmore Girls. I've loved her in pretty much every movie she has been in and lately she's been starring in some pretty hilarious films that just keeps coming. Spy was no different. It kept me laughing like Bridesmaids and the action reminded me of The Heat. This is definitely a great action-comedy to watch and would perfect for a movie night in whether you're on a date or with a group of friends. Not only do we get to laugh until our tummy's hurt, but we also get a bit of eye candy in this movie as well since both Jude Law and Jason Statham are in the movie as well. I'd definitely recommend this movie for any Melissa McCarthy fans and also just because this movie is hilarious and you'll definitely get a kick out of it. Plus the awesome bonus feature that has a hilarious gag reel that keeps you entertained. 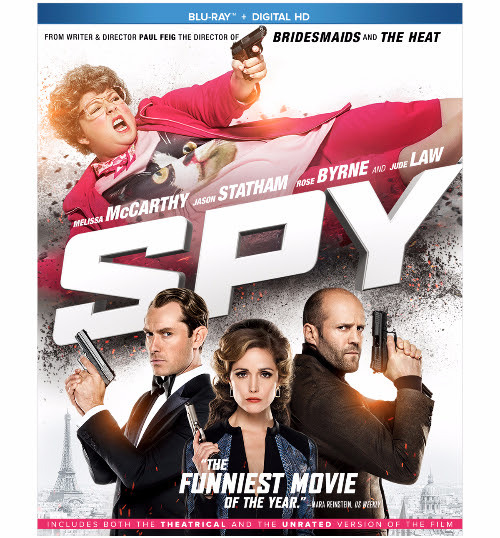 Spy is now out on both Blu-ray and DVD. Disclosure: All opinions are my own. I received Spy on Blu-ray at no cost for the purpose of this review. No other compensation was received.